The holiday shopping has been doing great for you, right? Have you already bought gifts to everybody in your list? If everyone in your list's already checked, then have you already bought something for yourself? You better have that one checked, too! During the stressful Christmas gift hunting, most of the time we exclude ourselves from our lists and that is a big NO NO. I mean, we've worked hard for the entire year and buying something nice for ourselves is something we truly deserve. Many of the people I know are planning on renovating their bedrooms as their Christmas treats for themselves. They say that the bedroom is the one place in their homes that they consider their solemn place and they want it to be as comfortable as possible. I totally agree which is why my boyfriend and I are also looking into this idea. First things first... the bed! We are looking for online shops where we can buy platform beds. There are actually many designs to choose from and the search is limitless. The Win Bed (please refer to the photo below) is for now at the top of our list. 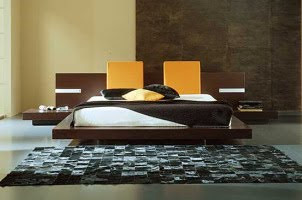 It is inspired by oriental atmospheres and will certainly look perfect in our bedroom. When it comes my choice of bedding sheets, I usually go for green, beige, white or black ones. I've come across the Alexa Grasshopper Modern Bedding Set by SIS Enterprises (please refer to the photos below) and it's the one I want! I am not so meticulous when it comes to bedroom dressers. 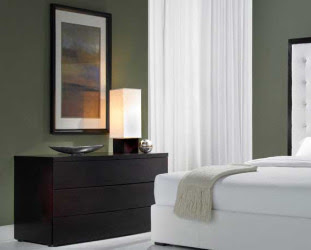 For as long as the piece is neat and simple just like the Ludlow 3 Drawer Wooden Dresser by Modloft (refer to the photo below), for me it looks modern and sophisticated enough to boost the beauty of any bedroom. That's our bedroom wish list at the moment. The search continues! Have a happy holiday shopping everyone! It all looks very lovely. Isn't it fun to look and plan? I like planning and item hunting so much. I enjoy it a lot. My boyfriend finds it boring though. hehe. thanks for dropping by Monica!